Here are two more installments in the exoticized lettering series, both discovered by John of bradshaw of the future. This says "lailaa majnuu" - लैला मजनू - which is the title of a legendary Persian love story that is often cited in romantic Hindi film songs. 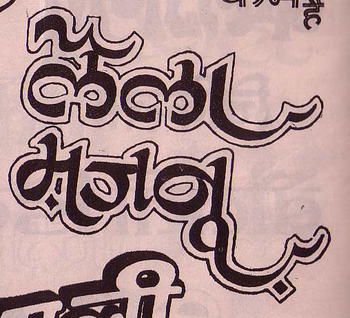 This beautiful sample, like the Umrao Jaan example of Udru-ized Devanagari that started this whole collection, is characterized by the absence of a rekha (the overhead line connecting contiguous letters in ordinary Devanagari), by long, stylized curved descenders on the letterforms and vowel matras, and the addition of meaningless dots that add to the Urdu feel of the lettering. Stay tuned! More to come. The Tamil is ஆட்டோரிக்ஷா ATTOrikSA, ie, "autorickshaw". Here's a "neither fish nor fowl" version, from a DVD I received today. For me, it is an example of the pointlessness you alluded to in your first post on faux scripts. How say you?